for more than 25 years. Determined that he must replace the Barber dime, as it had been in production for almost 25 years, Mr. Woolley requested and was granted permission to redesign the dime, as well as the quarter dollar and the half dollar. German born sculptor Adolph Weinman won a competition among a limited group of artists for the new designs and was commissioned for both the new dime and half-dollar. 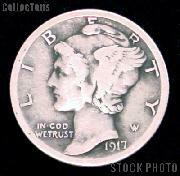 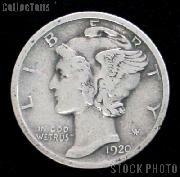 Production of the Mercury Dime began in 1916 after Weinman and then Chief Engraver of the Mint Charles E. Barber worked through the artistic and production requirements for the coin. 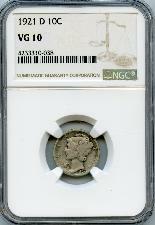 The Winged Liberty Head dime became known as the "Mercury Dime" despite the fact that the coin does not represent the Roman messenger god, but depicts a woman wearing a cap crowned with wings, meant to symbolize freedom and liberty of thought. The Mercury Dime remained in circulation until it was replaced by the Roosevelt Dime in 1946, though none were minted in 1932 or 1933 as the effects of the Great Depression reduced demand for new coins. 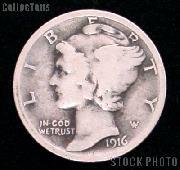 In 1945 the extremely popular President Franklin D. Roosevelt died, leading to calls for his image on a coin to commemorate him. 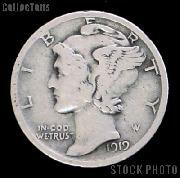 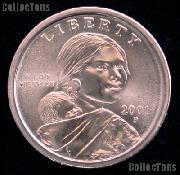 Since he had been a strong proponent of the March of Dimes Campaign the dime was selected as the coin to bear his image. 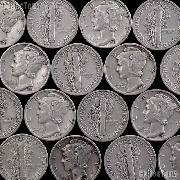 Mercury Dimes were issued in Philadelphia, Denver and San Francisco Mints. 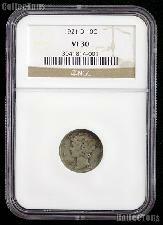 Interested in learning more about Mercury Dimes?